Hi buddies. Diwali is approching and I am here to share with you delectable Indian sweet recipes. Diwali is incomplete without the traditional Indian desserts. It goes without saying that sooji ka halwa is as traditional as it can get! 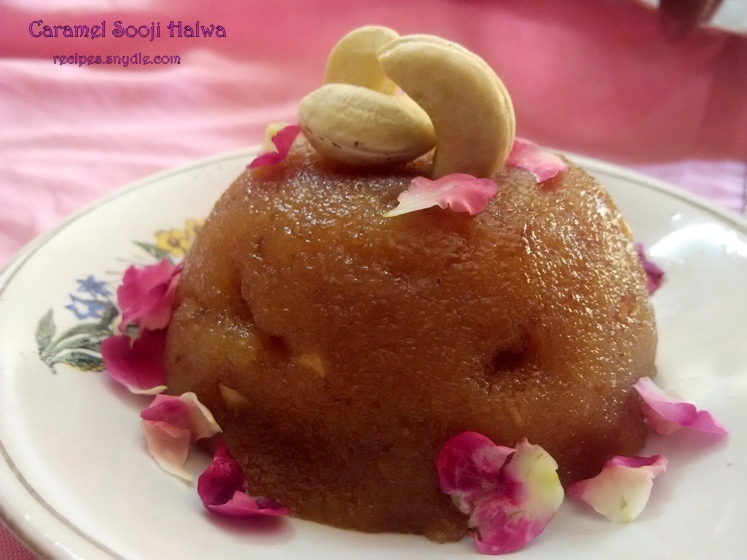 Suji halwa is basically a sweet podding made with semolina. Today’s recipe is a suji ka halwa but with twist! Do you like the flavor of caramel? If yes, then you are in for a treat! 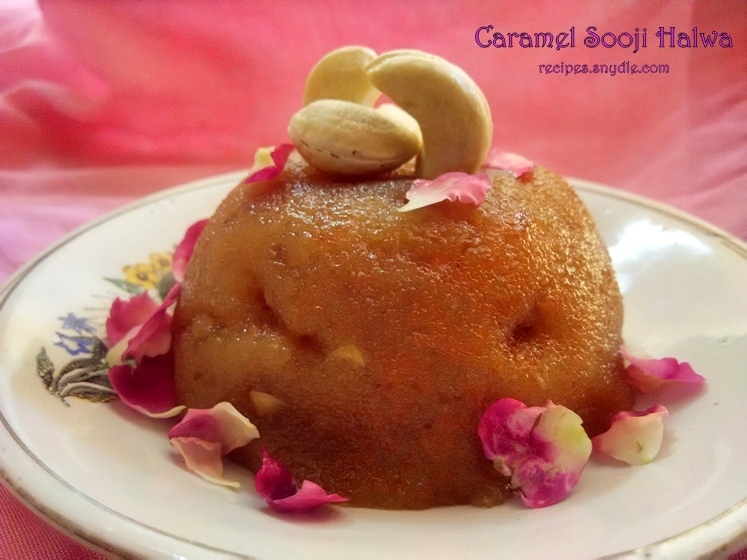 Caramel sooji halwa calls for the similar ingredients as normal sooji halwa recipe. This halwa has a distinctive caramel flavour that takes the taste factor up a notch. This halwa also gets its golden colour from the caramel. 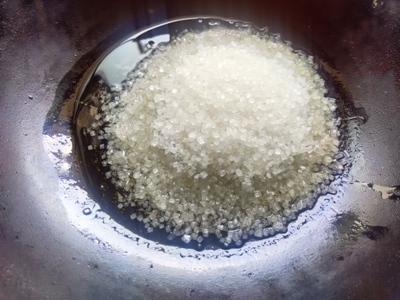 The halwa gets ready in a jiffy because the sooji is soaked in water for 30 mins, something which is not done for the usual suji halwa or rava kesari recipes. 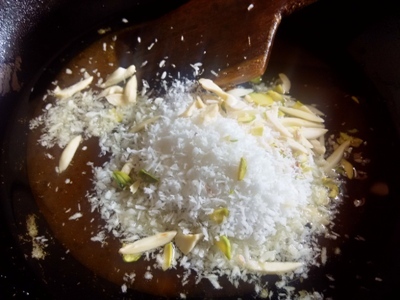 Apart form the characteristic caramel flavour, the halwa has nutty flavour from the coconut. 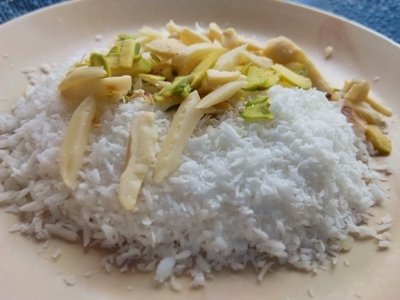 Also, the coconut flakes and finely sliced dry fruits lend an occasional crush to this melt-in-the-mouth-halwa. 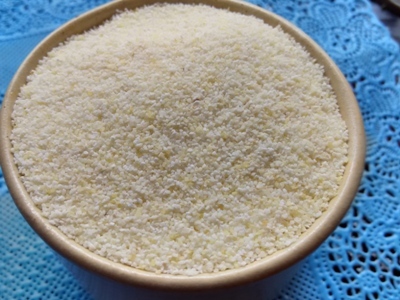 I have used thicker variety of semolina for the crumbly texture. 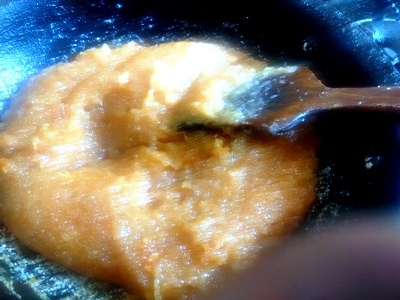 You can also use the thin variety of semolina, but somehow the halwa made with thicker semolina always turns out better. For the purpose of measurement, 1 cup = 250 ml. This recipe yields 4 servings. Now let’s seen how to prepare suji ka halwa. 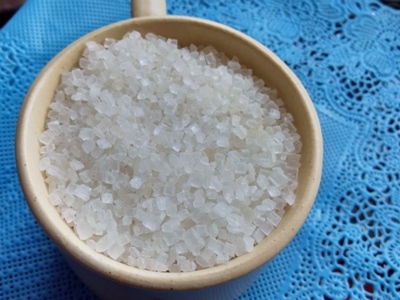 Wash and soak semolina in 3 cups of drinking water for 30 minutes. Heat a skillet on high flame and add ghee/ clarified butter. Allow the ghee to melt. 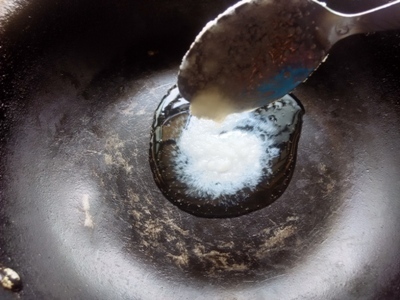 Add the sugar to the ghee when it gets very hot. Now reduce the heat to low. 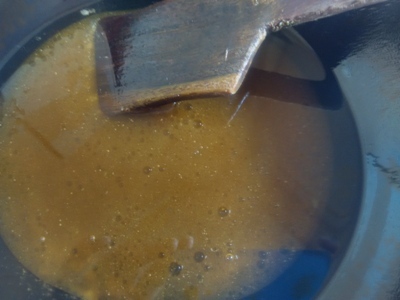 Allow the sugar to melt on low flame, until it gets caramelized. 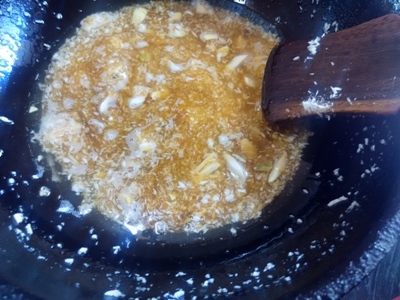 Keep stirring constantly.The caramelization process will take about 10-12 minutes. Now add the unsweetened coconut flakes, almonds, cashew nuts and pistachios to caramel. Mix it well. Cook the nuts for 2 minutes. Keep stirring constantly. Let there be 1/2 cup of water in the semolina. Drain the excess water. Add the semolina to the caramel. Keep the flame on medium and be very careful during this step because the water in the semolina causes the caramel to splutter around. 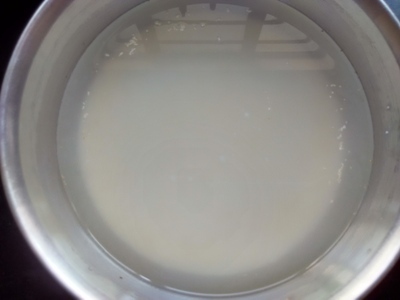 Stir continuously for about 10-15 minutes. 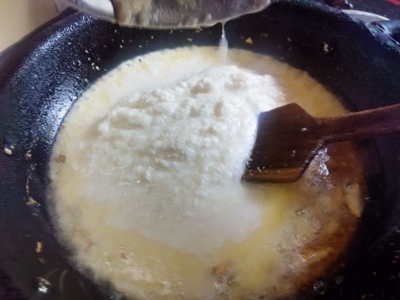 Cook the semolina until it starts leaving sides of the skillet. Caramel suji halwa is ready to serve. Take the halwa out into the individual serving plates and decorate it with cashew nut and rose petals. Enjoy hot or warm.